News Concerned About Your Kids’ Online Activities? Bellevue, Washington — June 25, 2018 — Parenting in the digital age is a huge challenge, but finally…there’s real help on the way. Today, the Un-carrier unveiled T-Mobile FamilyMode – a comprehensive digital solution that gives parents control over their kids’ online activities and screen time… on their phones and across the connected devices in their homes. Available June 29, T-Mobile FamilyMode is an app and device combo -- the app gives you control over your kids’ phones and T-Mobile FamilyMode Home Base connects to your home’s Wi-Fi, giving you the control you need over your other connected screens. American kids get their first phone at 10.3 years old, and parents estimate that their kids spend an average of 19 hours per week across their connected devices. But with each new screen comes additional concerns for parents -- 68% feel a lack of control over their kids’ online habits and 71% worry about kids’ screen time. 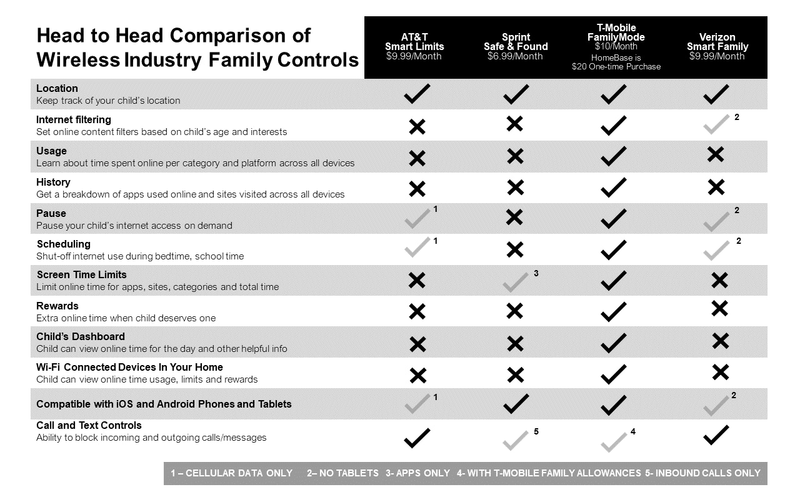 Head to head comparison of wireless industry family controls. Download image.